MainAll NewsInside IsraelWhat happened when US teacher lost $2,000 on Tel Aviv train? What happened when US teacher lost $2,000 on Tel Aviv train? American woman who volunteered teaching English to Israeli children lost $2,000 on Tel Aviv train - just before her return flight to the US. Employees of Israel Railways made an unusual discovery Thursday afternoon on a train in a Tel Aviv rail station. While employees of Israel’s national train company frequently discover and return lost items including cellular phones, hand bags and backpacks, clothes, and even cash, Thursday’s discovery drew the attention of station officials. A wallet containing two thousand US dollars in cash were found on one of the trains – lost by a passenger heading towards Ben Gurion International Airport. On Thursday afternoon, Sarah, an American English teacher who had been teaching Israeli children as part of a volunteer program, filed a missing item report at the Haganah train station in Tel Aviv. Sarah explained that she was returning to the US and was in a rush to catch her flight back home. 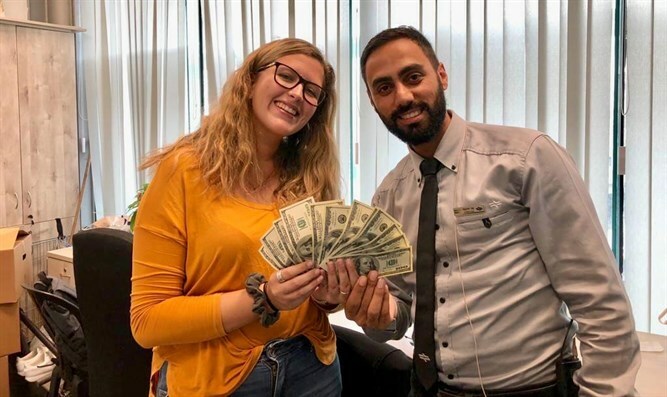 In her haste, however, Sarah had lost her wallet, which contained $2,000 in cash she had received from the volunteer program she had worked for. The station’s shift manager, Oz Yehezkel, promised that the station workers would do their best to locate her wallet and return it to a friend. Yehezkel also made sure Sarah caught a train to the airport, ensuring that she got to her flight on time. After taking Sarah’s contact information, Yehekzel notified employees regarding the lost item report. Shortly thereafter, workers located the wallet and brought it to the office, as Yehekzel notified Sarah’s friend, who later picked up the wallet. “I was really surprised when the station team called me up and told me that they found the money,” the friend said.